Published in April 2019 for the 2019-20 program year. 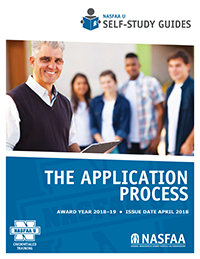 This guide will help you help students and families through the application process for Title IV aid. Lessons cover the formats of the Free Application for Federal Student Aid (FAFSA), the information needed to complete the FAFSA on the Web (FOTW) Worksheet, application output, and changing application data. Available as a PDF only. Be able to identify and describe the versions of the FAFSA students may use to apply for Title IV aid. Identify areas where mistakes are commonly made. Recognize the various application output documents. Understand when a school may accept a dependency override performed by another institution. Correction: Pop Quiz – Can This Student and Spouse Both be Head of Household? © NASFAA. All rights reserved.